The Godfather: The Game is set in New York City in the 1940s and '50s. 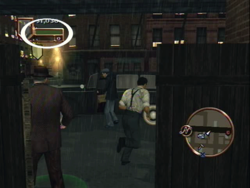 In the game, there are five mafia families and five neighborhoods, and when the game starts, each family controls one neighborhood. Your family is the Corleones and they control Little Italy. The Tattaglias, the weakest of the five families, control Brooklyn. The Straccis control New Jersey and the Cuneos control Hell's Kitchen. The Barzinis, the strongest of the five families, control Midtown. You can tell which family a mobster belongs to by the color of his clothing. The Corleones wear black, the Tattaglias wear brown, the Straccis wear blue, the Cuneos wear red, and the Barzinis wear green. The character you play is the son of Sarafina, widow to your father, a Corleone who was killed by a rival gangster. At the beginning of the game, Sarafina asks Don Vito Corleone, the Godfather, to help you out. The Don sends Luca Brasi to find you, train you, and get you started doing work for the family as an Outsider. The object of the game is to advance through the ranks of the Family by doing all the work you can for them, to do everything you can to destroy the rival families, and to get revenge for your father's death. There are also several things for you to collect in the game, in order to get 100% game completion. Look for people with the white puppet symbol over their heads. It means they have something to tell you. Whenever you do something good, and we're using the term "good" here loosely as you are playing a mobster, you will earn Respect for it. Killing rival mobsters, extorting businesses, taking over rackets, completing missions, favors, or hits - these are just some examples of things that earn you Respect. Earn enough Respect and your Respect Level will increase. Each time you go up a level you get 1 skill point that you can use to upgrade a skill. There are five skills that you can upgrade - fighting, shooting, health, speed, and street smarts. Each skill can be upgraded up to 10 times. If you are playing PS3 and Wii, the skill points are different and more expanded. Before each time you start your game, you are given the option to visit the tailor or the barbershop. When you visit the tailor, you have the ability to purchase new clothing for your character, such as coats, jackets, vests, shirts, pants, hats, shoes, and glasses. In addition to being able to use this clothing to change the appearance of your character, each item you buy gives you a respect bonus. You don't actually have to wear the clothing to get the respect, if you don't want to, you only need to purchase it. Going to the barbershop allows you to not only change the haircut of your character, but to also change several other features of his face. In addition to accessing the tailor and barbershop from the pre-game menu, you can also go into a tailor or barbershop business from within the game and talk to the owner to access the same features. 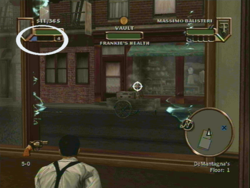 The core of the gameplay of The Godfather: The Game involves battling rival mobsters, either by hand-to-hand combat, using a melee weapon, or using a firearm. While using a gun is obviously more effective than using your fists, there are certain times in the game when you will have to use hand-to-hand combat. Or perhaps at times you simply decide you would prefer to use your hands. Also, if you are trying to build up your respect faster, using your fists is a good idea, because you earn more respect from killing your enemies that way compared to using a gun. Whatever the reason, let's learn now how to duke it out old school. The first thing you need to learn to attack your enemy, whether it is with your fists or a gun, is how to "target" or "lock-on" to them. To do this, press and hold and you will automatically lock-on to the nearest target. If you wish to target a different person, release then press and hold it again quickly and you will switch targets. Once you have targeted an enemy, you are now able to attack them. To do so, use + . Pressing Move + forward will deliver a quick jab, while + or + moving + left/right will throw a hook. Pressing Hold and then move forward will deliver a power attack. You can hold ( in order to charge the power attack. Pressing and holding while locked-on to an enemy will cause you to grab that enemy. You can then use the same combinations as above to deliver a different set of attacks. There are a few other things you can do using grabs. When grabbing, move in different directions to drag your enemy in that direction. The weaker your enemy is, and the less health he has, the easier it is to drag him without resistance. Also, your enemy must be standing for you to drag him. Speaking of which, if your enemy is on his knees, you can grab him and press flick + up to lift him back on his feet. To swing your enemy, use the left or right while grabbing. To throw your enemy, swing him and then let go of him by releasing and . If you get your enemy's back to a ledge, open window, or furnace, you can press to lean him over it. Press Flick + up again and you will throw him into it. Using a melee weapon is really no different than using your fists, as far as controls are concerned. Simply use the same combinations of locking-on and pressing move in different directions, but with a melee weapon drawn. To draw a weapon, press . Press to put a weapon away. Use Hold then use and to cycle through your available weapons. Another way to attack and kill your enemy without using a gun is to strangle him. There are two different ways to strangle someone in the game. You can use your bare hands, or you can use a garrote wire. To strangle someone with just your hands, grab them by pressing and holding and , then click and hold and move + left/right in opposite motions. To strangle someone with the garrote wire, you must be behind them. Press to crouch so that you can sneak up quietly behind someone. When you are behind them, and with the garrote drawn, press and hold and move + left and right in parallel. To use a gun, you must first have it drawn. To draw a gun or any other weapon, press . Press againMove or press while you have a gun drawn to reload that gun. Press to put the gun away. Use Hold while searching through with and to cycle through your available weapons. To fire a gun, you must first lock-on to the enemy you wish to shoot by pressing and holding . Then press to fire your weapon at that target. You can use to target specific areas of the enemy you are locked-on to. For example, if you aim and shoot at your enemy's head, it will kill them in one shot. If you shoot their shoulder, it will disarm them and they will drop their weapon. If you shoot them in the knee, it will immobilize them and make them fall to their knees. If you're trying to shoot a specific object instead of a person, you will need to use free-aim mode instead of trying to lock-on. Press to enter free-aim mode. A crosshairs target will appear. Use to aim the crosshairs where you want to shoot. Probably the most important thing to learn in the entire game is how to take cover during a gun battle. If you do not use cover, you will not make it anywhere in the game. There are two ways to take cover - by using a wall or low objects. You can press when standing next to any wall to take cover against that wall. You can then use to slide left or right along the wall. When should you take cover against a wall? When there are enemies around the corner (or when there may be enemies around the corner and you want a safe way to check). When this is the case, take cover against the wall, slide to the corner, target an enemy and then fire at him just like you normally would. When you fire, you will automatically turn the corner to shoot, and then when you stop firing, you will automatically return to behind the wall. The same applies to using low objects for cover. Besides for fighting and shooting, you will spend the majority of your time driving, so it'd be a good idea to learn how. The first thing you need to know is how to get in a car. To enter a parked car, simply walk to either the driver side or passenger side door and press . To hijack a car that someone is already driving, press the same button to threaten the driver, then press same button again after they get out. Note however that drivers won't always get out when you threaten them, sometimes they will attempt to speed off. If they do so and you decide you definitely want that car, shoot the car a couple times and they will stop but you need to be quick before it disappears. To accelerate the car, press or . To brake or go in reverse, press or . To use the handbrake, press . The handbrake is useful for taking sharp turns at high speeds and is a good skill to master. It will help you get places in a hurry. To honk your horn, press move . Honking will cause cars in front of you going the same direction to steer to the right and cars coming towards you to steer to the left. It will also warn pedestrians to get out of the way. When you crash into things or your car gets shot at, it takes visible damage. Eventually it will start smoking, then the smoking will get worse, and eventually it will catch on fire. When it does, stop immediately, get out quickly, and run away fast because it means that it's about to explode. Your health is represented by a green bar in the top-left corner of the screen. When the bar loses all of its green, you are considered "iced". If this happens during a mission, you can restart from the last checkpoint, otherwise you will wake up in a clinic or hospital back to full health. You can find blue health bottles during the game that will return your health to 100%. Besides for finding these bottles, you can also purchase them from clinics for $100 bucks. Safehouses are a very important part of the game. For one thing, you can only save your game by going up to the bed in a safehouse. They are also useful when running from the cops and as a place to restock your ammo. Unowned safehouses are represented by an orange house on your map, while owned safehouses are represented by green houses. You can also use this place to get away from a mob war but it's better to bomb their shop, bribe the FBI or bomb their compound which is risque. Using your map and notepad is vital to your success in The Godfather: The Game. To access your map, press and select it from the menu. You will see lots of symbols on the map. Press to bring up a legend that explains what each symbol means. Blue, yellow, and purple circles on the map indicate places where you can accept a mission, hit contract, and favor respectively. If these colors are Xs, it means that is the next place to go to complete the mission, hit contract, or favor. You will also see lots of symbols that have one of the five families insignias on it. These represent businesses that you are able to enter and extort, and the insignia represents which family currently controls it. Press to view your notepad. Your notepad contains a list of your current objectives. The missions represent the main storyline of the game. They are represented by blue Xs and Os on your map. You will earn money and respect for each mission you complete, as well as advancing the story. Also, after completing certain missions, the Family will promote you in rank. 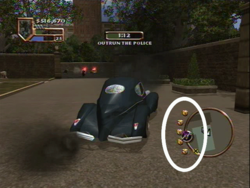 Almost every mission contains hidden bonus moneybags which are just one of the many collectibles in the game. Hit contracts are a type of side-quest that you can attempt throughout the game. They are represented by yellow Xs and Os on your map. You will earn money and respect for each hit contract you complete. Each hit contract has a target and bonus condition. The target is the person you are hired to assassinate and the bonus condition is the preferred way your employer wants the hit to go down. Fulfilling the bonus condition will earn you much more money and repsect than you would earn killing the target a different way. Favors are another form of side-quest. They are represented by purple Xs and Os on your map. You won't earn money by completing favors, but you will earn respect. A different type of favor you can find in the game is a merchant favor. These occur when you try to extort a certain shopowner. They will ask you to do them a favor and if you complete the favor, they will accept your payment terms. Favors are useful to add more value points to your RPG menu where you upgrade many factors like health and speed. Extortion is a popular method for mafia families to earn money. Owners of a business agree to pay the Family each week, in exchange for the Family's "protection". Often, the owner is simply paying for protection from the family that is trying to extort him or her, as refusing will often result in damage to their store or themselves. There are 100 businesses in the game that you can extort on behalf of the Corleone Family. You can find these businesses by looking on your map. Any business with a rival family's insignia on it is yours for the taking. To extort a business, go up to the shopowner (they will have a puppet symbol above them) and press . If your respect level is high enough, they will agree to pay you without any problems. If they refuse however, you will need to convince them. A "pressure meter" will appear in the upper-left corner of the screen. As you pressure them, the meter will go up. There will be two lines on the meter, one indicating when the owner will give in, and one further down that indicates when you've pushed them too far. When you get the meter between the two lines, it means that if you talk to the shopkeeper again, the extortion will be successful. The closer you get the meter to the breaking point without going over, the more money you will extort from them each week. If you go past the breaking point however, the owner will start fighting back and you won't be able to collect a dime from them. There are 10 different ways to pressure a shopowner, and each shopowner has a particular weakness to one of the ten. If you exploit this weakness you will earn a "weak spot bonus" which is added to the weekly extortion payout. The 10 different methods are threatening with firearms, using firearms, using melee attacks, jabs and hooks, grabs and strangles, throws, slams, and leans, threatening a power attack, reasoning/intimidating, threatening innocents, and property damage. There are 100 rackets in the game available for you to take over. These are generally located in the backs of legitimate businesses. Often, you will have to extort the owner of those businesses first, in order to gain access to the back. Be careful though, the family who owns a particular racket will almost always have goons there protecting the place. Once you enter the racket they will start attacking you. Unlike business owners, racket bosses will always give you the option to buy them out without any trouble (as long as you don't threaten them first). If you do end up in a situation where you need to pressure the racket boss, the rules are the same as extorting a shopowner. When given the choice, you should always extort a business or buy out a racket without any trouble. When doing so, you will automatically receive the maximum payout possible. When you successfully extort a business or take over a racket, the payment you "negotiated" will be added to your payday income. Every payday, you will receive this money, minus a tribute to the Corleone Family. As you go up in rank, the percentage of tribute you pay goes down. Warehouses and hubs are sort of like rackets on steroids. Instead of a small casino or brothel in the back of business, warehouses and hubs are their own buildings which house and deliver stolen goods. They are worth a lot more money than normal rackets and thus are also much more protected. To take over a warehouse or hub, kill all the rival thugs protecting it and then buy out the racket boss just like you would a normal racket. Compounds are the homes and headquarters for the five families. As you can imagine, they are the most heavily guarded and fortified establishments in the whole game. To take over a rival family's compound, you must plant a bomb in the basement of both buildings of the compound and blow them up. Because warehouses, hubs, and compounds are so fortified with manpower, you are advised to hire a crew member to help you bring them down. Any time you do something illegal in the game, your "heat" level goes up in the neighborhood in which the crime was committed. Heat refers to how wanted you are by the police, and how much effort they will put into finding you and fighting you. Your heat level is represented by police badges in the lower right corner of the screen. You can have anywhere from 0 to 5 badges, 0 meaning you are not wanted at all and 5 meaning that the police will be all over you. Your heat level will go down slowly on its own, as long as you aren't committing crimes, but you can also bribe police chiefs to bring it down instantly. Police chiefs can be found on your map by looking for a yellow police badge symbol. When you bribe a police chief, your heat is brought down and your police bribe meter is filled up all the way. The police bribe meter is a green meter in the same location as your heat level badges. As long as the bribe meter isn't empty, the police will look the other way when you commit a crime and your heat level won't go up. Not only that, but if rival thugs start fighting with you, and any cops are around, they will come to your aid and help you fight. Besides for bribing the police chiefs, you can actually bribe any cop you find on the street. When you bribe a regular cop, the police bribe meter will fill up a quarter of the way. It's always a good idea to bribe the police before any objective that takes place out in the open. It ensures that they won't interfere. Well if you own the next generation consoles (Xbox 360, PS3, Wii), if you're interested in getting the heat down for free, try to finder a woman with a sign on her head that she has something to tell you. She'll give you the task that will take down the police chief. You can do it anytime but if you don't want any major interference when taking down a compound, warehouse or any kind of business, this is the way to do it. Whenever you kill a gangster, your vendetta level with the family he was from goes up. 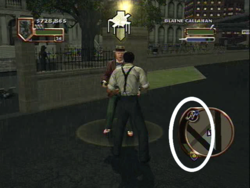 You can view your vendetta levels with the five families by going to Tom's Report in the pause menu. If your vendetta gets too high with a certain family, you will start a mob war with that family. During a mob war, you will find yourself being constantly attacked by members of that family wherever you go. If a mob war goes on for too long, the family you're fighting with will start to bomb the businesses under your control. Also, if you get iced during a mob war, you will awake to find that several of your businesses have been bombed while you were out. When a business under your control gets bombed, you will not receive any income from that business until they reopen which can take a while. There are two ways to stop a mob war. You can either bomb one of the rival family's businesses, or you can bribe an FBI agent, also known as a G-man. The latter is less fun, but much easier and thus the method we recommend. You can find G-men by looking for the gold FBI badge on your map. Most, but not all, can be found in the basement of churches. You can bribe G-men at any time to lower your vendetta with the families, not just during a mob war. Lastly if you start in any mission during the time, your vendettas automatically drop in order not to ruin your progress. To upgrade your guns, get ammo for your guns, or to buy explosives such as molotovs, dynamite, or bombs, you need to find a black market merchant. On your large map, they each have a different symbol, according to what they sell. On your in-game mini-map in the lower right-hand corner of the screen, they are all represented by a white diamond shape. Each gun in the game has a level 2 and level 3 upgrade that you can purchase. The upgrade will make that gun more powerful, faster, and able to hold more ammo. To purchase the upgrades you need to find the specific black market merchant that sells it, and you need to bring lots of cash with you cause the upgrades aren't cheap. If you're about to take on a particularly tough objective, or if you're just looking to get some extra muscle, you can hire a crew member. Crew members can be found in every neighborhood by looking at your map. They are represented by an icon of a head in profile. You can only hire one crew member at a time and you can only hire crew members that are equal or lower than you in rank. The higher the rank of a crew member, the more expensive they are to hire, and also the tougher they are and thus more effective in battle. If you decide you no longer want a crewman following you around, you can talk to him and tell him to go home. Check the weapon the crew is going to use before you decide to hire him. There are several things for you to "collect" in The Godfather: The Game. One of those things are film reels. There are 100 film reels hidden throughout the city. Many of them unlock a real clip from the movie that you can watch by going to the pause menu. You also earn 1,000 Respect points for each film reel you collect. Another thing to collect is cracked safes. There are 100 safes throughout the city, located somewhere in businesses. Most, but not all, businesses have one. To "crack" a safe, simply plant dynamite next to it and get to a safe distance. Each safe you crack also earns you 1,000 Respect points. There are 5 prize fights to be fought and won throughout the city. Each fight you win will earn you $10,000 big ones. There are 6 banks throughout the city which can be robbed. To rob a bank, you must find the vault and blow it up with dynamite, just like a safe. Some banks are small and have their vault right in the lobby. With other banks though, you will have to make it down into their basement to find the vault. Once you steal the money in the vault, you have to get back to a safehouse without being caught for it to count as a successful heist. Another thing to "collect" is execution styles. There are 47 different ways to finish off your enemy in the game. Many of them involve using the Execute button with motion gesture when you are standing next to an enemy who is low on health. Try doing this with different weapons and alternating between your enemy standing and kneeling to perform different executions. To advance through the ranks of the Corleone Family you must complete the missions. Completing all the missions will bring you to the rank of Underboss. To become the Don, you must complete all the missions and take over all four rival family compounds. To achieve the supreme rank of Don of NYC, you must complete all the missions, take over the four compounds, and take over all the rival families' businesses, rackets, warehouses, and hubs, and you must earn all 22 of the Execution Styles by performing each one at least once. This page was last edited on 17 November 2011, at 02:25.